If you have ever owned a Windows Vista computer you are probably very familiar with the User Account Control (“UAC”) popup that displays every time you install something or want to change any system settings. This annoyance or “feature” has carried over to Windows 7. Good thing it is similar to Vista with regards to being as easy to disable the UAC popup message in Windows 7. [adblockingdetector id=”1″]NOTE: In order to disable the Windows 7 UAC popup message you must be logged into an Administrator user account. 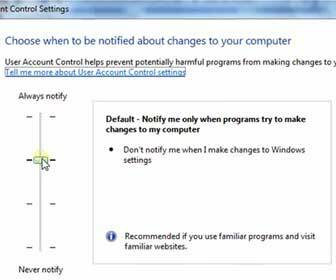 If you are on a normal User account you will not be able to adjust the UAC pop Windows 7 settings. This is the #1 problem why this tutorial will not work for you.